One of the privileges of my role at Save the Children is that I have the honor of working closely with the specialists who run our programs to improve the wellbeing of children and their families. It is their expertise—in education, health, protection, emergency response and more—that enables Save the Children to be a leader on children’s issues and deliver on our promise to reach every last child. Nearly 100 years ago, our founder Eglantyne Jebb started that promise. Standing up and raising her voice—literally, on the streets of London—Eglantyne advocated for the unique needs of children affected by World War I. There are many Eglantynes around me in our organization today: staff who listen to the unique needs of people in the U.S. and around the world and put all of themselves into making a change. Today, on International Women’s Day, I’m recognizing a couple of the experts who use their knowledge to be champions for women. Because to be a leader on children’s issues, we must be champions of women’s issues. 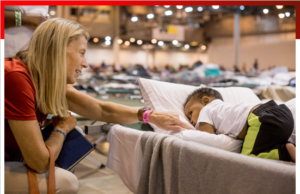 When emergencies strike, Sarah Butler thinks of the moms. A specialist in emergency nutrition, Sarah is a leader on breastfeeding in emergencies. One of the ways Save the Children protects babies is by supporting their mothers—providing information, resources, safe spaces and more to encourage women in emergencies to breastfeed their babies. In the chaos of a disaster or a refugee camp, food, water and hygiene are unreliable. Breastfeeding their babies is the best thing mothers can do to provide them with fluids, nutrition and immunity support. Not only does breastfeeding ease stress in babies, it avoids the need for formula mixed with contaminated water, which could spread potentially fatal diseases and diarrhea to babies. Sarah loves her job because by helping women in emergencies breastfeed, she is showing them how incredible and resilient their own bodies are. Brad Kerner had a bright idea about opportunities for girls: As a reproductive health advisor, he had worked in many countries, including those where women’s and girls’ rights were restricted. Along with Save the Children colleagues, Brad developed a program called Choices, which involved kids in the conversation on gender equity. The curriculum brings 10- to 14-year old boys and girls together to talk about things like their dreams for the future. Brad knows that in order to empower girls to become the women they want to be, the boys and men in their lives need to understand girls’ experiences and ambitions—it all begins with empathy. These are just two of the people who make our work possible, and I’m proud that Save the Children is filled with people helping kids by empowering women. Eglantyne Jebb set that example from the start. To celebrate International Women’s Day, I ask you: who are the Eglantynes you see in your work? Basma* was in her elementary school classroom near Damascus, Syria when the building was hit. This curious 8-year-old is eager to learn, but violence has displaced her family multiple times. This has meant different schools, none as good as the one back home. When another school she attended was hit, 20 students died. Sadly Basma’s experiences and fear do not make her unique. In a new report just released by Save the Children and the Peace Research Institute Oslo, we found that 357 million children around the world live within conflict zones. That’s more children than the entire US population living within 31 miles of conflict. Many of these kids have never lived in peace. In Jordan’s Za’atari refugee camp last year, I met boys and girls who, like Basma, don’t get to attend the schools back home their parents dreamed of sending them to. Save the Children is running early education programs in the camp so that these children, forced from their schools, are able to build the crucial foundations of their educations. If a kid’s childhood is impacted by conflict, what will her future be? Trends show that conflicts are lasting longer. For example, Afghanistan has had at least 17 years of conflict and conflict has afflicted Iraq for the better part of 15 years. In the most dangerous countries for children in conflict, fighting can take away entire childhoods. All aspects of a child’s life can be impacted when she lives in a conflict zone. More mothers are dying in labor at home because they cannot access health facilities, or are afraid to because hospitals are commonly targeted in modern fighting. Children who do survive birth in conflict zones may not have access to healthcare as they grow up for the same reasons. Diseases prevented by vaccinations in peace-time, like polio and diphtheria, take hold, compounding the threats children face. A child’s mental health can be impacted into adulthood due to the trauma of violence. Conflict is more dangerous for children now than at any time in the last 20 years, and attacks on schools are the “new normal.” Today, 27 million kids worldwide are out of school due to conflict. Some have never been inside a classroom. The interruption of education has a long-term impact on children’s futures and the socio-economic recovery of a country. All children deserve a healthy start, the opportunity to learn and protection from harm, but conflict can rob all of this from a child. It is the responsibility of the international community to protect children from the horrors of war. We must commit to preventing children being put at risk, upholding international laws and standards, holding violators to account and rebuilding shattered lives. Protecting children affected by conflict is Save the Children’s founding mission, and nearly 100 years later, it remains our top priority. Our founder Eglantyne Jebb said, “Humanity owes the child the best it has to give.” It is difficult to dream about the future when, like Basma, all you’ve known is war. We owe children childhoods free of conflict. When Lokuru brought her 1-year-old baby to get food at Save the Children’s stabilization center in northern Kapoeta, South Sudan, she had another concern on her mind. The night before, her daughter Hakaroom’s breathing had become heavy and labored. Her small body was starting to feel hot. A nurse at the center recognized Hakaroom’s symptoms as pneumonia and sent her to the Primary Health Care Center, where the infant was treated for severe pneumonia with antibiotics and fluids. All of Lokuru’s four children have suffered from pneumonia at some point in their lives, but Hakaroom’s case was the worst. According to the Save the Children medic who treated Hakaroom, without immediate medication, she would not have lived through the night. Nearly 1 million children died of pneumonia in 2015. I continue to be shocked by that fact. We know how to prevent, diagnose and treat pneumonia, and we have known for a long time. So why do so many children around the world still lose their lives to this disease? You often hear people describe an illness with the cliché, “it doesn’t discriminate.” I want to be clear: Pneumonia discriminates. Pneumonia is a disease of poverty. Ninety-nine percent of child deaths from pneumonia occur in developing countries. Within these high burden countries, it is the poorest and most marginalized children who are at greatest risk. A child should not die because of where she was born or what resources her family has. The world’s poorest children are more likely to suffer pneumonia risks such as malnutrition, indoor air pollution and a lack of primary healthcare. If they do get sick with pneumonia, they are the least likely to get medical treatment. Each year, about 40 million cases of pneumonia are left untreated. Because inequality can be fatal, Save the Children has committed itself to reaching Every Last Child. Our organization is working to improve the health and wellbeing of the poorest and most marginalized children around the world. When the United Nations developed the Sustainable Development Goals in 2015, it proposed that by 2030, no child should suffer a preventable death. We cannot achieve this goal if we do not overcome pneumonia. 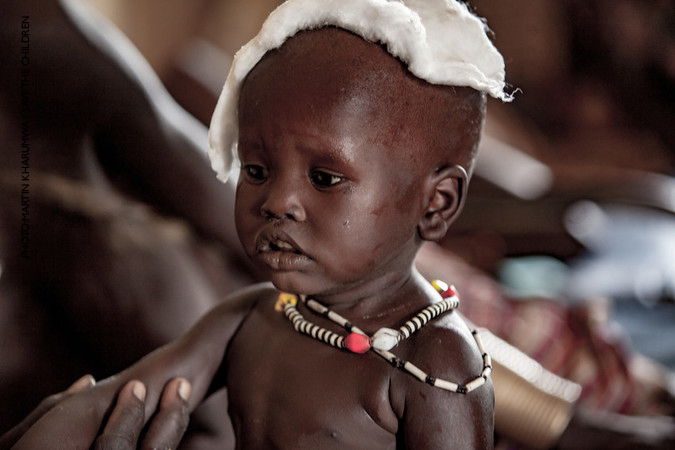 Save the Children is a leader when it comes to combatting pneumonia. We have been preventing and treating the disease in children for decades. We can prevent pneumonia by increasing immunization, addressing undernutrition, ensuring safe water, sanitation and hygiene, and reducing household air pollution. Most cases of pneumonia can be treated with a simple course of antibiotics. To end pneumonia deaths for good, the global community needs to come together with equitable solutions. We’re asking Congress to increase funding for USAID’s Maternal and Child health programs and to support and pass the Reach Every Mother and Child Act. To learn more about how Save the Children is fighting pneumonia for all children and how you can help, please visit SavetheChildren.org/pneumonia. A recently-published study in the medical journal “The Lancet” showed that deaths from diarrhea among children under 5 dropped by 34 percent from 2005-2015 — a major step toward ensuring that no child dies of a preventable or treatable disease. But half a million children still die from diarrheal diseases every year and millions more are sickened by unsafe drinking water, which turns a simple sip of water into a potentially life-threatening act for a vulnerable child. The woman, wrapped in a colorful head scarf and long flowing dress, sat on a cement step in the middle of a remote village in northeastern Somaliland. 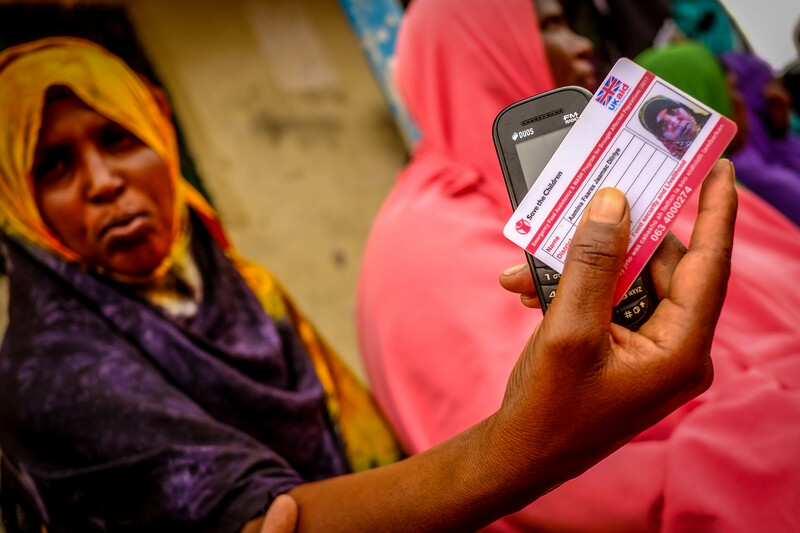 She proudly showed me the small mobile phone and the Save the Children registration card bearing her photograph. Then she told me how it was transforming her life, in the midst of a horrific drought. The small phone, with money transferred from Save the Children’s drought relief program into a monthly account, meant her children could eat and continue to go to school. It gave her the independence to ensure that funds were going to meet her family’s greatest needs. And it allowed her to go to local shops and buy what she needed, using funds of about $90 per month transferred from her phone to the merchant’s phone in small increments—so no actual money changes hands. This allows her to pay for her weekly needs each time she goes to shop, despite the fact that all her assets had been lost. The people in this region depend on livestock like goats and camels. Their whole life revolves around moving from place to place with their animals to graze, selling a few goats a month or a camel twice a year to support the entire family. But when the drought started last year and the rain failed to come, there were no more grasslands for grazing and no water to give to the animals. First a few died, then several more each day. Many of the women I spoke to on my visit this week had lost all their animals. Those with larger herds had gone from 200 goats to just 40 over the last few months. The cash program managed by Save the Children and other partners and funded with money from the European Union serves as a lifeline for these families. And because mobile money can be transferred directly to the phones (which are also provided if recipients don’t have one), it is a secure and efficient way to ensure that money gets into the hands of mothers who will use it to benefit their children. We can also benefit from the data available through the telecom companies, which details how much has been used each month and at what merchant—allowing us to track usage and patterns to improve our programs for families in dire need. 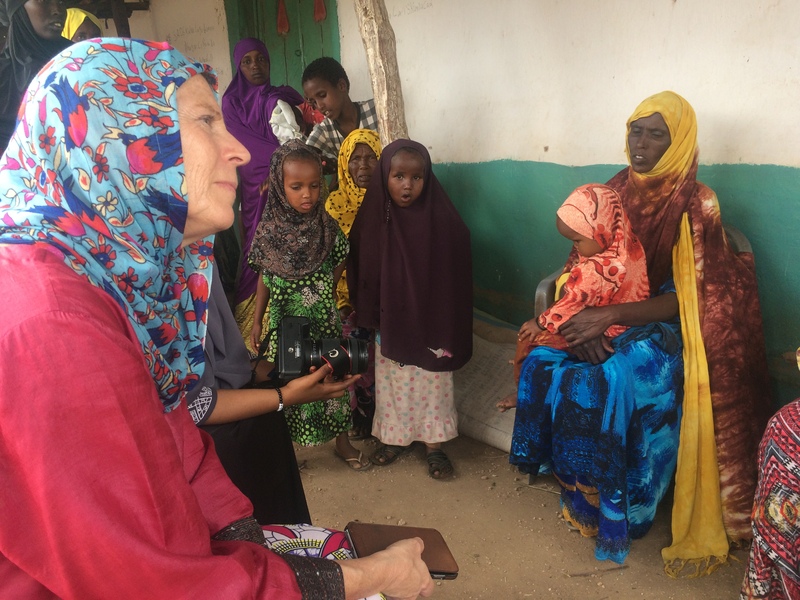 Best of all, the children of this community are not going hungry, they are staying in school and they are able to survive one of the worst droughts to hit Somaliland in decades. And even halfway around the world in the middle of an extreme drought, I found that some things about new technology are true everywhere. When I asked one of the women if they had trouble learning how to use the phone, they said no…they just got one of their children to help them. Just like me and every other mother around the world! As I sit on the plane on the way back from Beirut, Lebanon, typing at 30,000 feet, my mind keeps going back to one of the more emotional moments I’ve experienced in a long time. I’m back to a small set of chilly cement rooms where a mother, father and three children live in northern Lebanon, listening to them tell me about how they fled here after years under siege in their home village of Hamah in Syria. The family had seen such heartbreak that it was hard to take it all in during our brief time together but now, at cruising altitude, it hits me like a fist. Perched on thin mattresses on the cement floor, we asked the mother and father about their journey and what life was like for them. They started by thanking Save the Children for the help we had given by putting doors and windows into the bare concrete walls, in installing a sink and toilet in the apartment, and making the stairs safe to use. The father talked about how he has only been able to get sporadic work in the northern Lebanese village; Syrians are only allowed to work in construction, agriculture or low-skill odd jobs and it meant their resources were incredibly stretched. A young boy, less than two years old, sat in his mother’s lap and a cute, energetic 4 year-old played peekaboo with me and giggled loudly. Then one of our team asked an innocent question – why was their 8 year-old son, stirring under a blanket on the raised platform bed in the room, not in school? The father looked down and we saw the pain cross his face as he told us that his son, Haddi, fell from a two-story balcony in the unfinished building eight months ago, shattering his hip. After two unsuccessful operations, he had a third one three weeks before our visit; this operation cost the family all of their savings and put them further into debt. His mother began to cry as she told us how they had tried to get him to the best doctor they could find and showed us the X-rays—images that showed three screws in a small, fragile hipbone. This boy was not in school because he was in intense pain and had barely moved since they brought him back from the hospital. I saw the shocked look on the face of our local team member who managed the work on the apartment, who had not seen the family since before the accident and had no idea it had happened. We tried to think of what to say to this family, to give them some hope that their son would be okay. In a circumstance I can only describe as fate, one of our visitors with me on this trip was from the Pacific Northwest and her daughter had been in an accident as a young girls and had the same operation for her crushed pelvis. She comforted the weeping Syrian mom as best she could, telling her about her daughter’s story and full recovery. But we knew that was with some of the best medical care in the world and months and months of rehabilitation. This was not after three surgeries, laying on a wooden bed with few medicines, no wheelchairs and no daily visits from a physical therapist. We wanted to give some hope but you could see in the parents’ faces that for this family, hope was fading. Later we spoke to our team about trying to get more medical care for Haddi, care that would probably stretch the emergency fund we keep for such dire cases to the limit. We will somehow find a way to help him. But there are so many sad cases as the Syria crisis moves into its seventh year. So many thousands of cases of children’s lives lost or shattered, of childhoods cut short when 11 year-olds begin to work picking vegetables, when 14 year-old girls are married to “keep them safe”, when children leave their families to go on their own to try to get somewhere safer, better, saner. As we spoke to some of UN partners the next day, I sensed some hope that, though it would be difficult, maybe on the horizon there will be a time when some of the 1.5 million Syrian refugees living in Lebanon feel safe enough to begin going back home. But as the war now stretches past the duration of World War II, I worry for the Haddis that we don’t reach, that we don’t know about, for whom hope and time is truly running out. Please help us provide support and hope to Haddi and his family—and so many others like them—by donating to our Syrian Children’s Relief Fund.